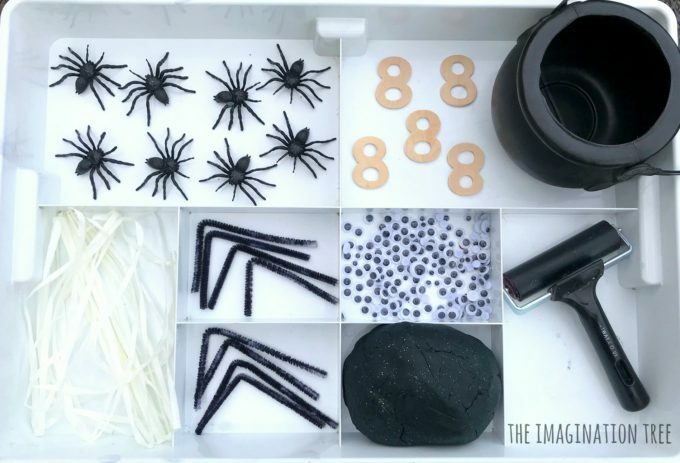 Make a spooky spider play dough activity tray to work on early maths skills of counting and numeral recognition, as well as giving those fine motor muscles a fantastic work out too! 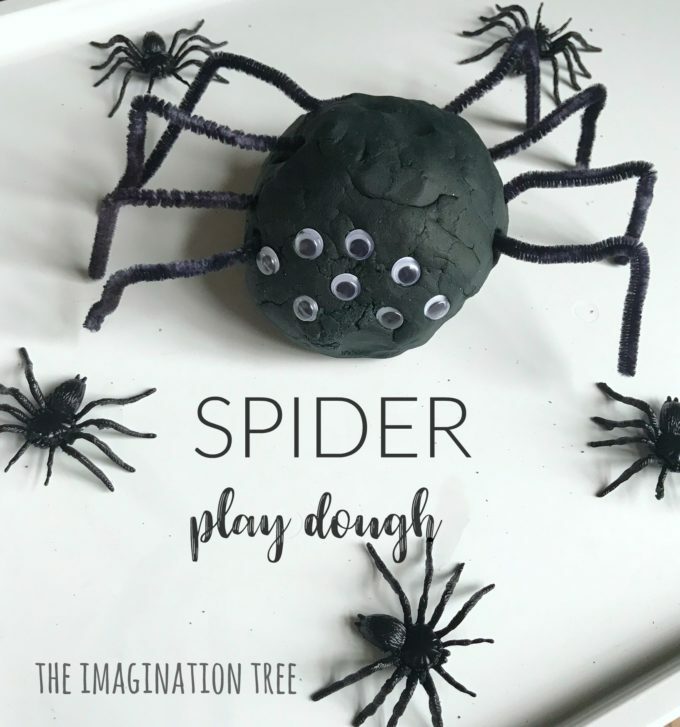 I also tend to find play dough is the great leveller with a wide range of ages of children as they all love that sensory input no matter how old or young. My 10 year old still loves to play with it after a long day at school as a wind down method! 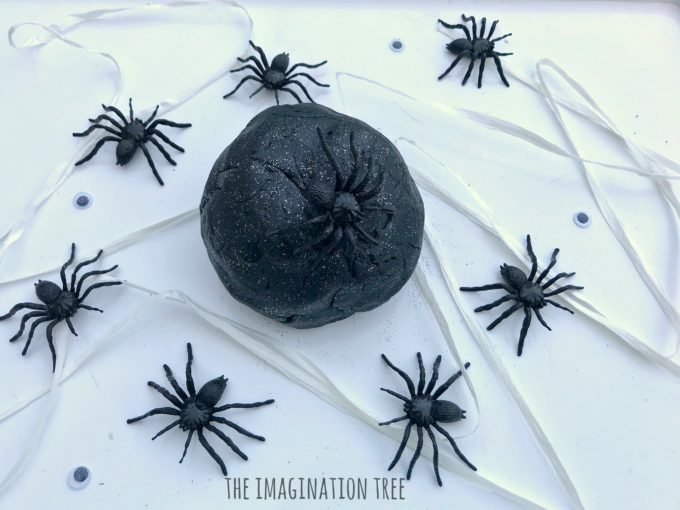 Add some lavender like I suggest in my natural lavender play dough recipe here, and you’ve got a brilliant calm down method before bed too! I’ve started to use this sectioned drawer insert (part of the KUGGIS range from Ikea) for lots of our invitations to play recently. I love how simply and clearly it separates items and helps children see clearly when choosing what to play with. Mix the dry ingredients in a bowl. Add the oil and mix well. Now add the gel food colouring to the boiling water and stir until combined. Add this gradually to the dry ingredients, stirring until fully combined. 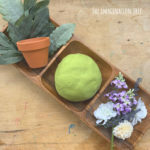 When cool enough to touch, take the ball of play dough out of the bowl and knead it on a lightly floured surface until all of the stickiness has gone. Expect it to take a few minutes! At this stage sprinkle on some silver glitter to make it sparkle! It should be soft and pliable, ready to play. Troubleshooting: this recipe works for me 100% of the time for me, so any different results may be to do with altered ingredients or measurements. This is normal in any recipe making! Make sure you are using real measuring cups, not a cup from the cupboard (I’ve had this happen a lot with readers!) If it turns out too dry for some reason, start by adding one extra teaspoon of oil and knead well. If this still hasn’t helped then another dash of boiling water should do it. If too sticky add another few tablespoons of flour. But try kneading it more before you do that, as often that’s the issue. 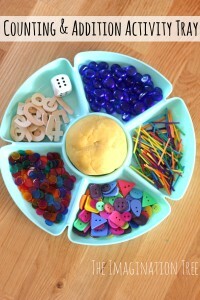 Set out all of the materials on a tray, basket or large plate ready to play! Follow your child’s lead and let them direct how they will use the loose parts with the play dough, as it may be very different to what my kids chose to do! They all loved adding lots of googly eyes and using the white raffia to create spider webs. 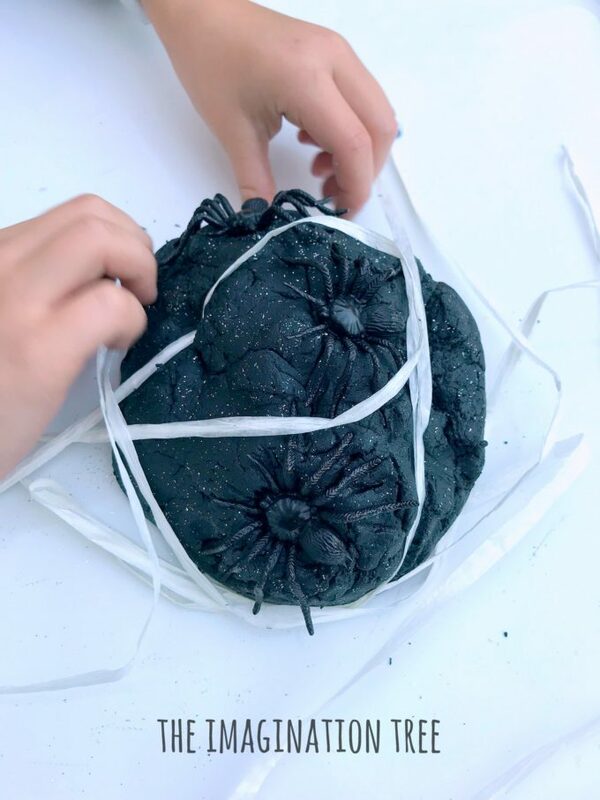 One child found that the raffia made great imprints when pulled off the dough again, so they followed that interest for a while, seeing what other patterns they could create! 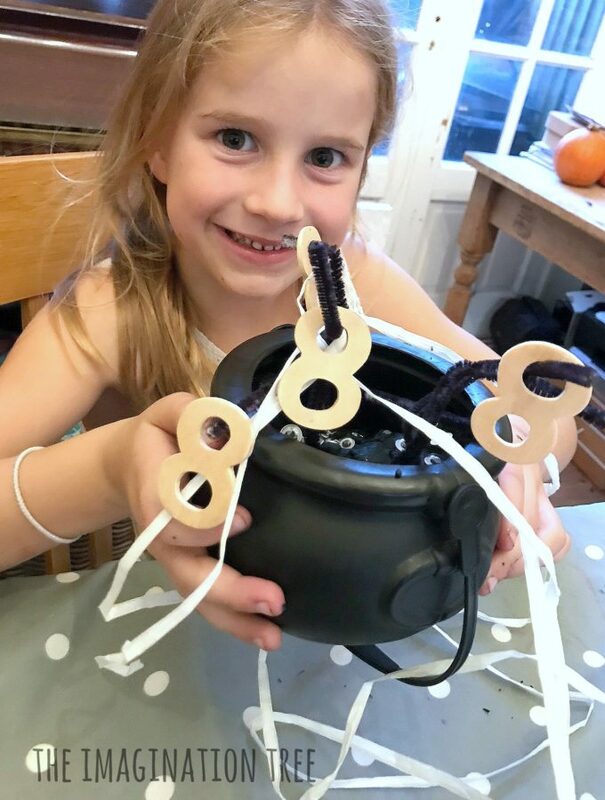 At one point Miss 6 started to mix all of her “ingredients” into the cauldron to make spider stew, hanging the number 8s from the pipe cleaners, which I totally loved! 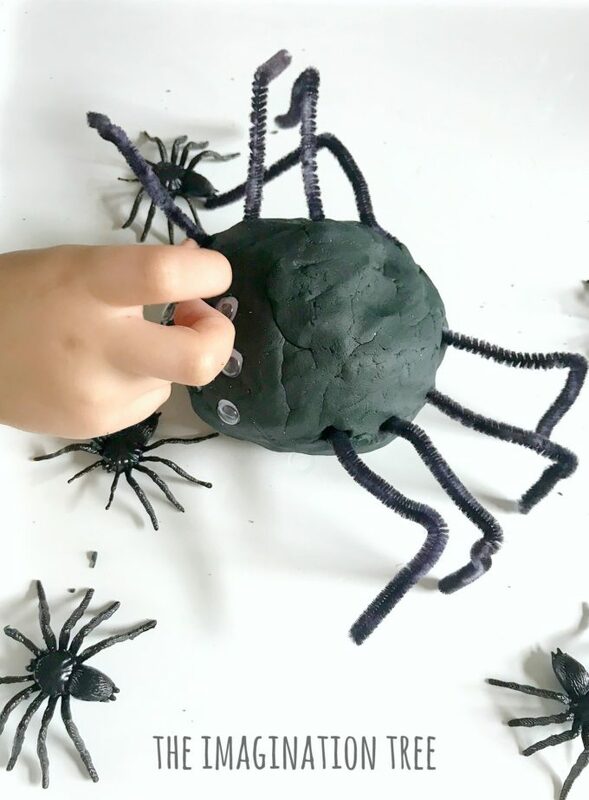 Mr 3 really liked the idea of making giant spiders using the pipe cleaners to make legs and adding loads of googly eyes to the face. 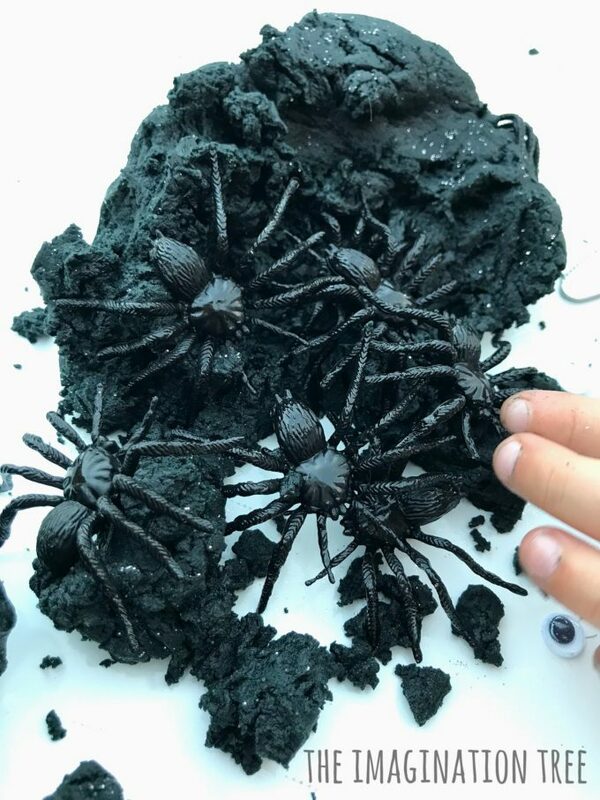 He was keen to make a whole family, using the toy spiders as the babies. When playing alongside him I talked about spiders having 8 legs and he counted his to make sure he had the right number. We looked at the 8 numerals and he incorporated them into his play, naming them correctly as he did so. There are so many opportunities to develop learning further with this simple type of invitation to play. 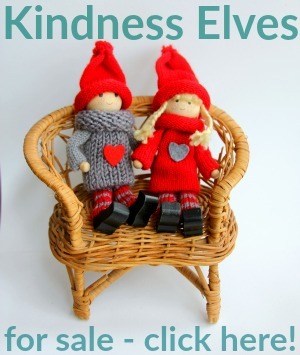 Language, vocabulary, numbers, counting, storytelling and imaginative play as well as fine motor development. 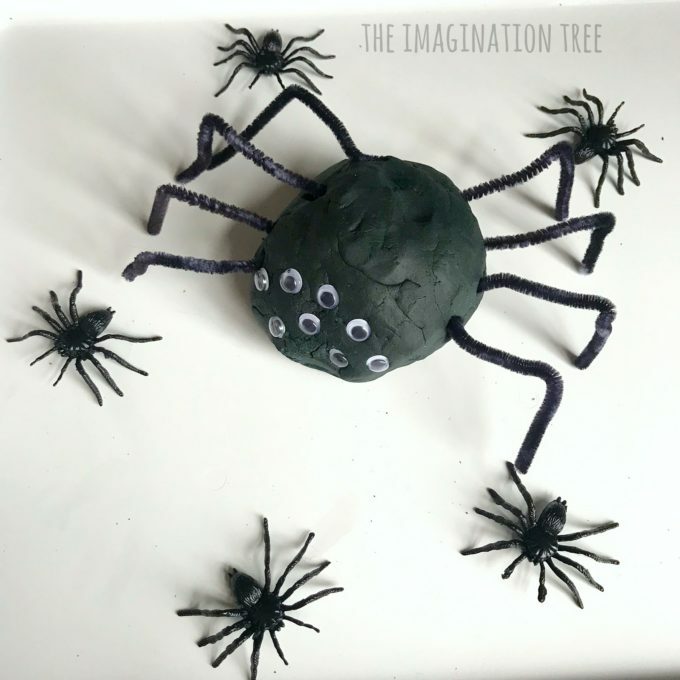 Picking the spiders and eyes out of the dough and pushing the pipe cleaners into it are all a great work out for small hand muscles! 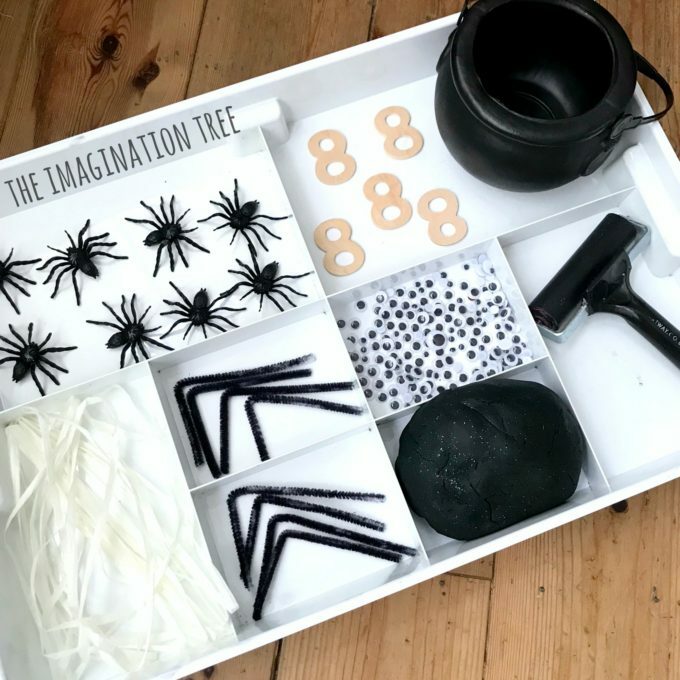 Pair the tray with some favourite spider themed story books to enhance the play even further! Here are a great selection of spider books on Amazon. 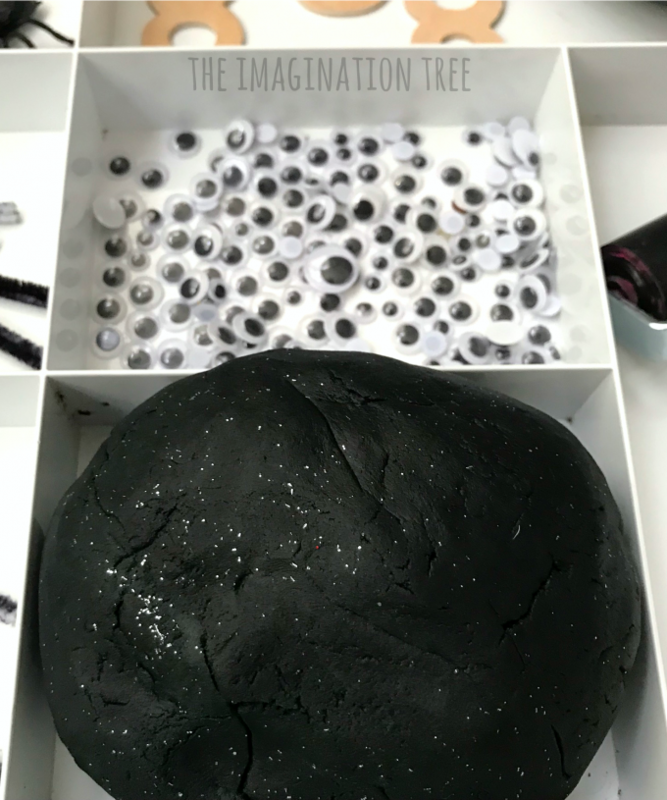 You may want to check out our entire PLAY DOUGH ARCHIVES for a huge range of ideas to be inspired by! 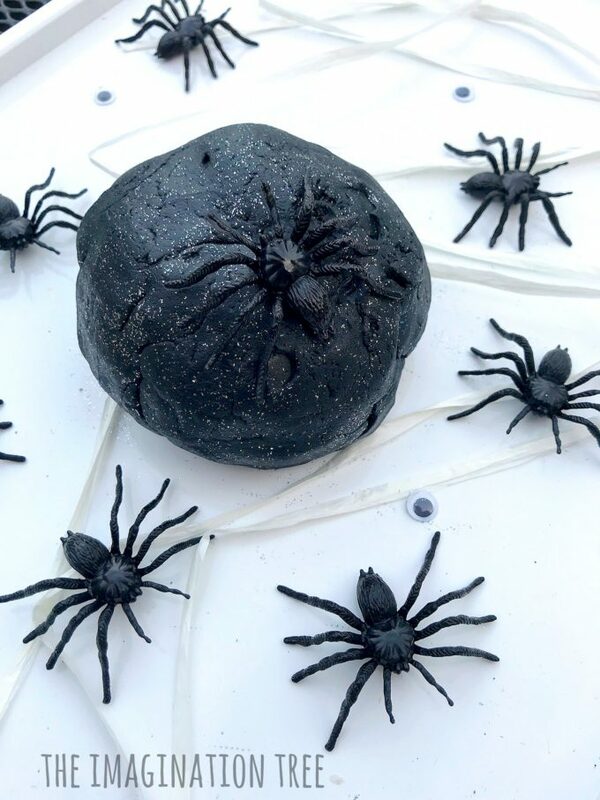 And here are some more SPIDER ACTIVITIES if your little one is an arachnoid lover! 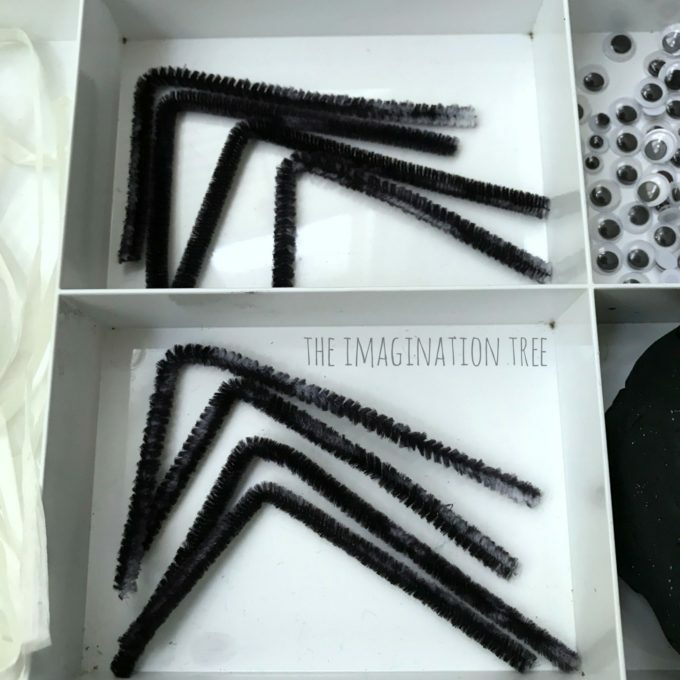 Find a zillion more FINE MOTOR SKILLS IDEAS here too! 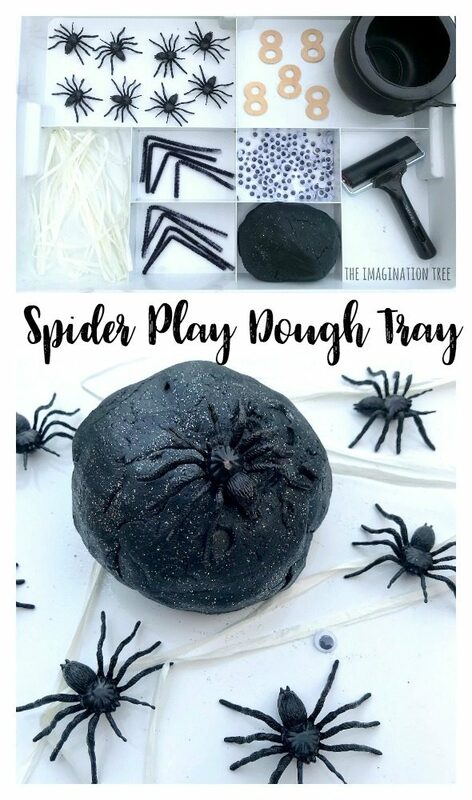 If you loved this spider play dough activity tray ideas please do share on social media! 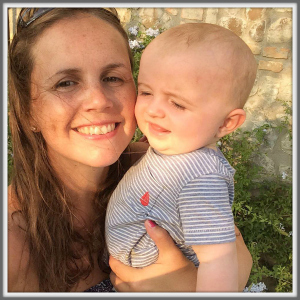 Come and follow me on Instagram too! I do something similar with my preschool class with cut flexible straws, various googly eyes, etc. One of my favorite add-ons are the fake vampire teeth. I cut them in half so the top and bottom teeth are separate. The kids love making play-doh monsters with fangs.